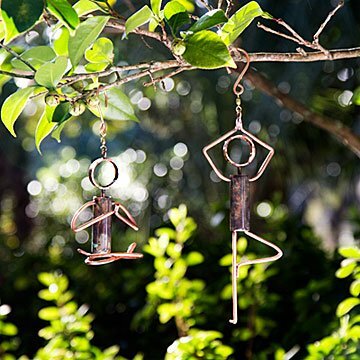 These hanging sculptures represent two yoga poses, rendered in copper. Invite the calming principles of asana into your home or yard with these serene hanging sculptures by Catherine Murphy. Two mindful yogis execute the tree, lotus, triangle, and downward dog poses, rendered from shaped and welded copper with patina that's lacquered for preservation. Hang them in a window, doorway, porch or garden as charming reminders to infuse your surroundings with your practice. Handmade in Asheville, North Carolina. Click here to see our Yoga Pose Garden Sculptures. Visit the blog for more on Catherine's creations. Growing up in a military family, Catherine Murphy spent her childhood discovering new places around the world, and every place's characteristic outdoor sites. Each time she sits down to create a new piece, however, the metalworker pictures it living in her favorite place in the world: "a fabulous garden," she says, adding that she's "amazed and inspired by life in the garden.” Her nature-themed copper sculptures only serve to make the green spaces themselves more amazing. In fact, it’s that merging of her two loves that "feeds my soul and keeps me motivated," she says. And if the North Carolina resident ever gets stuck, all she needs to do is go outside. "When those moments come up, my go-to spot is a bench by the river," she says. "Living in the mountains and working beside a river make for a wealth of inspiration." Designed for year round, outdoor use. I will buy an additional pose. Enjoy seeing the pose first thing when I enter my home. This is PERFECT! My mother-in-law loves yoga and outdoor art. This little yoga statue is well made and will stand up to the elements, not to mention so CUTE!! This product will enhance the ambience of my dear friend's yoga studio. This item is beautifully made and it is so cute! I love it and I know my sister will too! I was very pleased when I opened the box and saw this beautiful copper yoga hanging sculpture. The one thing that I had been worried about was that there wouldn't be a protective coating on the copper but it had a clear weather protectant on it. In the past I've bought copper hanging outdoor ornaments and the copper weathers in a very short time and takes away the beauty of the object...no problem here, artist knows how to protect the essence of her work! I am always looking for something unique & made in the USA, this gift was exactly what I was looking for. Very pleased with the quality, will order from this seller again! The recipients of these garden sculptures absolutely loved them. They are unique and beautiful.